Whether you’re a homeowner or a contractor, when a project involves carpentry the nail gun is a must-have power tool in any toolbox. It will be your best friend. As such, these tools must be evaluated carefully. You might be interested to find out which is the best brad nailer, but the truth is that it's not a simple question. Brad nailers are compact and lightweight power tools designed to enhance the efficiency, and in general, use 18-gauge nails called brads (hence the name) which are essentially a thinner gauge of nail. There are three types: pneumatic, cordless and electric brad nailers (also known as stapler nailers). As we said before, choosing the best one is not an easy task, and can be overwhelming. You see that now, right? Fortunately thanks to this article we’ll walk you through the best ones of each category. Read through for our choices, key features and benefits, how to choose them, uses, advantages of each type, maintenance and much more. What is a 18 gauge brad nailer? 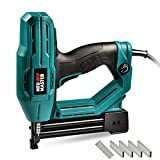 What about the staple gun electric brad nailer? How to use a 18 ga brad nailer? 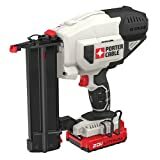 9.5" x 2.6" x 9.5"
10.2" x 2.68" x 9.8"
Our top pick for the best cordless brad nailer is the PORTER-CABLE PCC790LA 20V MAX Lithium 18GA Cordless Brad Nailer. It is the only nailer on this list that does not suffer from even one flaw. PORTER- CABLE provides a high-quality tool at a reasonable price. Technically, the DeWalt was by far the highest-quality model on the list. However, its high cost is a problem for some people. With a list of features that match our criteria so nicely, it would be hard to give the top spot to any other. Our top pick for the best electric brad nailer is the Electric Staple/Brad Nail Gun, NEU MASTER NTC0040 Heavy-duty Tool. It’s a tool that promises and delivers all thanks to its powerful 6.5-amp drive solenoid. For anyone looking for a versatile stapler, the Neu Master tool guarantees. Dimensions: 9.5" x 2.6" x 9.2"
Fastener Length: 3/4" to 2"
Dimensions: 13" x 2.8" x 11"
It comes with a durable blow mold case for ease of portability. It also features hex keys, air tool oil, and a rubber grip handle for ease of use. It is sold with a one-year warranty-inch. The operating pressure allows you to work on even the toughest materials. The NPT air inlet fitting has a diameter of a 1/4 inch, which allows the nails to be drilled on the material with ease. The exhaust port is adjustable by just rotating it to 360° until you get the right direction of the outputted air. 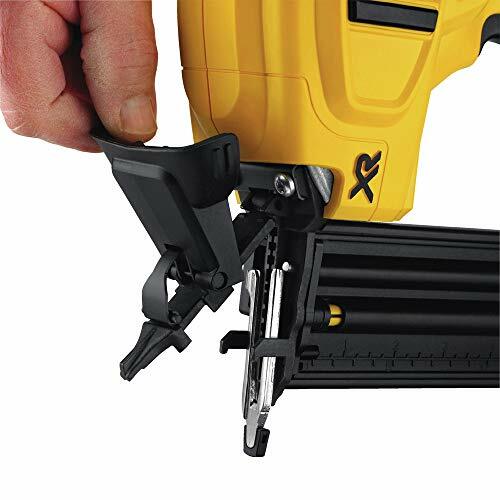 The quick release latch is designed near the front of the nailer. This makes it easy for you to clear jammed nails quickly without affecting your work. It is available at a super friendly price. A poorly designed instruction book, which makes it difficult for beginners to use it. Dimensions: 10.2" x 2.68" x 9.8"
The body is lightweight and well-balanced. These features will allow you to use the nailer all day hassle free. The grip is designed with elastomer, implying that you will be comfortable while holding the nailer. The nose is easy to clear and you don't need tools to operate it. This makes nail extraction simple and quick in the event of a nail jam while using it. The drive depth can be easily adjusted to give your project a professional finish. 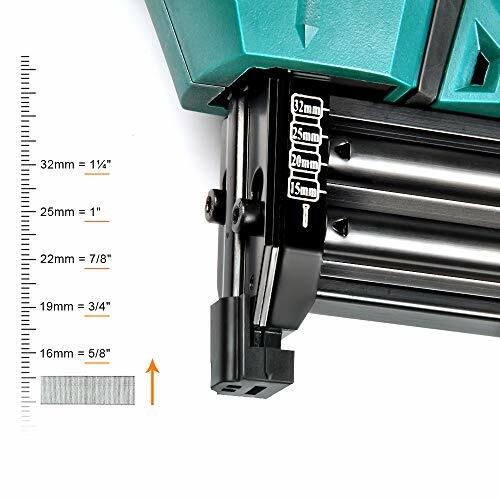 This nailer has a tool-free jam release mechanism for easier working time. Its operating air pressure ranges makes the nailer a perfect choice for use in multiple projects. The nailer can work with nails that have a height of 5/8 to 2-inch and the magazine can hold up to 100 nails. The depth of drive can be adjusted with ease since the nailer allows for the counter-sinking of the nails. It has a rear exhaust to keep contaminates away for work efficiency. Magnesium body so It's strong and lightweight . The nailer tends to jam sometimes. This one is the first on the list because is a good buy for both amateur and professional contractors. The PCC790LA is relatively inexpensive. The entire kit includes a battery and a charger. The 20V Lithium battery is said to be capable of 450 nails per charge, which is more than enough for the occasional and professional user. The best thing about this model is that it is consistent and reliable. Its failure rate is extremely low, even after sitting unused for months. It can take brads of up to 2 inches. It operates smoothly and efficiently with almost no noticeable recoil. We also really like the jam clearing mechanism, which tends to spit the nail out as soon as you raise the cover. It comes with a 3 years warranty, which is almost worth the cost in itself. The Ryobi P320 is an affordable option. Despite its relatively low cost, this model delivers a lot of quality. It is sturdy and well-padded for durability, and it is also very easy to grip. It's a little heavier than the DeWalt, but not by much. One thing I like is the fact that the nose piece is very easy to access and clean. This also makes it much easier to remove a jammed brad. The depth adjustment wheel is easy to use, because you can see the movement of the mechanism as you turn the wheel. This makes it easier to avoid turning in the wrong direction. The P320 also has a power adjustment to ramp up the pressure of its internal air compressor. 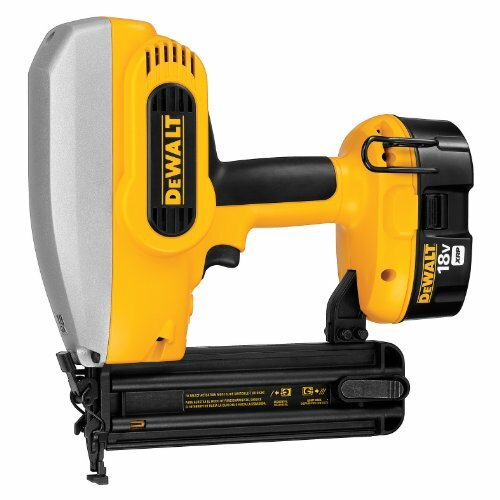 This nailer has a very long battery life and is confirmed to fire about 1500 brads on a single full charge. It takes nails up to 2 inches long and has a very robust and simple magazine setup. My favourite feature is the separate trigger button to control the work lights. 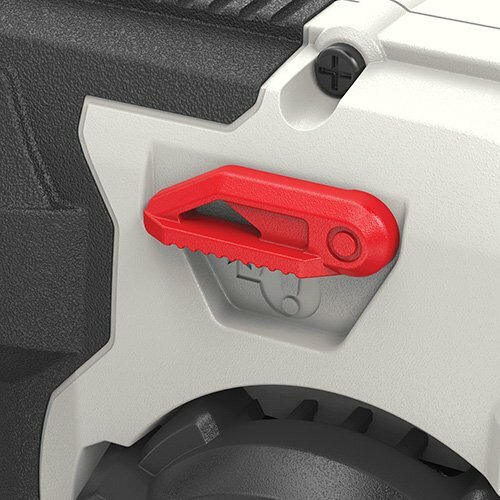 This separate trigger can do a lot to prevent unplanned nailing incidents. 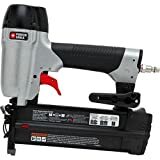 Fastener Length: 5/8" to 2-1/8"
This is another cordless model and is probably the best if you can afford it. The price tag is intimidating, but this really is a top-of-the-line model. For one thing, there is no trigger delay at all. It is very light, weighing about 5 lbs in total, and can take any sort of brad. Because of its lack of ramp-up time, the bump mode works great, and can be very helpful when doing a big job. I remember doing a large roof one time and being slowed down by the ramp-up time of our inferior nail gun. I would love to have had something like this. The 20V DeWalt batteries are powerful and charge rather quickly. The guide lights are bright and well-aimed, and the depth control is incredibly precise. I also like the little belt hook on the side, as it is very handy when you're using multiple tools. Another great aspect of the DCN680 is the anti-marring system with which it is equipped. The magazine has an automatic cut off so that you don't mark up your wood surface with a dry-fire. The tip is also padded to prevent any marring that might otherwise occur. 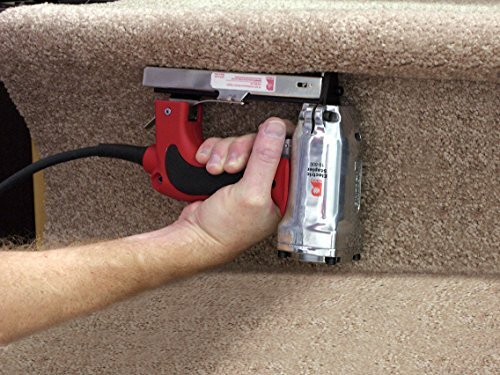 The Neu Master nail staple gun features an adjustable power knob. This makes it easy to use on either hard or soft materials by adjusting the power. The tool also assures the user of optimum safety with its contact safety pole setting. This means the trigger is only triggered when the safety pole is pressed. Also designed with a no-MAR rubber tip, the tool ensures the work surface is protected, and marks and dents are avoided. The product is also fit for wide applications since it works with 1/4'' crown staple from 5/8'' up to 1'', and 18-gauge brad nail from 5/8'' up to 1-1/4''. It also features a soft and comfy two-finger trigger which ensures to keep firing steadily. Drives both staples and nails. Cannot work on dry walls. It features a unique dual power lever, which you can adjust to low or high. This allows the nailer to be used with either hard or soft materials. It uses Stanley Sharpshooter TRA700 Series or Arrow T-50 heavy-duty staples and 1/2-, 9/16- and 5/8-inch brads. The depth of the fired staples can easily be adjusted by simply turning the wheel to get the desired settings. It also has a flush nose that will enable you to staple the tight spots. It is designed with a contoured grip so you are most comfortable while handling it. The design gives the nailer an antijamming feature so that you can save time as you work. It is made with a low-brad indicator window that shows you when the magazine needs reloading. Its mechanism allows quick and easy jam clearing for efficiency while working. The driving power of this nailer is flexible so it can fit versatile projects. It may be hard to control the nailing process. The Roberts professional electric stapler delivers more power that enables it to drive staplers deeper. This is thanks to its powerful 15-amp drive solenoid. The electric stapler is also designed with a 6-3/4" low profile head. This allows the user to access even tighter spots, for example, stairs. The product also features a hardened driver mechanism that allows it to drive 20 gauge, 3/16-inch staples in lengths of 3/16″, 1/4″, 5/16″, 3/8″, 1/2″ and 9/16″. It is fitted with a heavy duty 12 feet power cord (14 gauge), the tool taps maximum power. The cord also ensures it can be used in a large area without extension cables. The Roberts electric stapler is designed with a quick-release bottom loading magazine. This provides for fast loading of staples. With its ergonomic non-slip handle as well as a rubber grip, the tool ensures control and comfort for the user. Extra powerful tool with 15 amperes drive solenoid. Comes with a large plastic carrying case that allows for an extra box of staples and other small tools. Has a low profile head for accessing tighter spots. Secures a variety of flooring including carpeting. Relatively heavy at 7.3 pounds. An 18 gauge brad nailer is a tool that fires small nails (called "brads"). Brad nails are formed from 18 gauge wire, so they are small in diameter, therefore they have less holding stress. Because of the nails size, brads are easier to drive in small pieces of wood trim. As a result, they are suitable for situations in which a large nail would be unnecessary or carry a high risk of splitting so they provide a cleaner look. This take us to the next question, What is a 18 ga brad nailer used for? You should have an 18-gauge brad nailer to enhance the efficiency in your workshop. When working on projects that require soft or hard materials, a brad nailer will enable you to drive nails precisely where they are needed. This is bound to make your work accurate, thus giving your project an attractive finish. It's a must-have power tool in any toolbox. it's a great all around nailer in the woodworking shop. It is also an ideal choice for working on assembling cabinets, putting trim work on cabinets and furniture, adding face frames and for users looking to attach thin strips to wooden projects. The same also applies to individuals working on delicate and small trims. An electric brad nailer is corded and runs by electricity. It used for different applications, and in general, it can be used as a nail gun or stapler. The main uses of an electric stapler gun are for furniture, and the difference between a staple and a nail is the head and the form. A staple has a more sturdy grip, and it keeps the material in place in situations where a brad nail may not be strong enough. However, for finishing carpentry work an 18 ga. brad nailer must be used instead of a stapler electric brad nailer. When choosing a brad nailer, you can choose between a corded electric brad nailer and an uncorded electric brad nailer. Both have their upsides and downsides. A corded nailer is more convenient in the fact that it does not have to be charged beforehand. A cordless nailer is more convenient in the fact that it does not require you to tether yourself to a socket or compressor. For working on finishing projects in high, the cordless one is probably the better choice. Becoming tangled in the cord could be a serious safety hazard. Also, it is more practical to work with a cordless model as you don't need to worry about compressors, hoses or extensions. As far as you have the battery charged, you are ready to go. However, the corded model will tend to have more power and will fire faster. 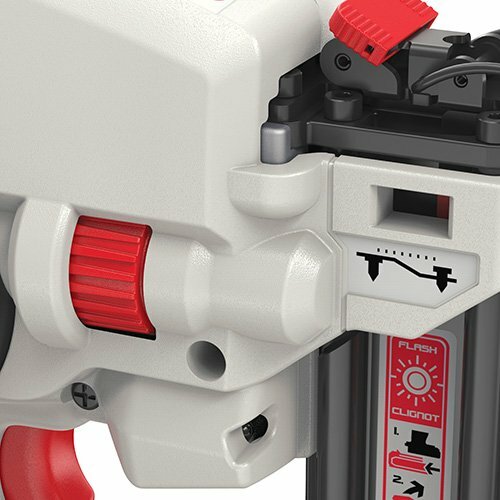 A battery powered nailer has to use an internal mechanism (such as an electromagnetic flywheel or an air compressor) to amplify the power of the battery. This creates a slight delay between shots as the mechanism powers up. To evaluate the relative value of your brad nailer, you need to look at several different qualities. When you are using your nailer, you may be using it for hours at a time. As such, you need to think about its weight and balance. Remember, a nailer that is too heavy or awkward will only become more cumbersome and tiring as you continue working. As such, it will slow you down and impede your work. This factor is especially important for nailing overhead. Although it is less important, you should also consider the recoil. This factor is less important because nail guns generally have very little recoil. Most nailers today use a simple loading system that involves inserting a clip of nails into a slotted magazine. However, there are many small variations that can be found. When evaluating a nailer, you should take a look at the loading procedure. It might not be possible to actually load the nailer before you buy it, so do your research. Reload time is another factor that can reduce your efficiency and cause your jobs to take more time than necessary. I would also recommend looking at magazine capacity when thinking about your reload time. You certainly don't want to waste your money on something that is not sufficiently durable. You should always look at the materials of which a nailer is made. The outer parts of a nailer can be made from plastic, metal, rubber, or a number of other materials. Most nailers are made with a plastic outer casing, but the thickness of the plastic can tell you if the manufacturer places a high value on durability. You should also carefully examine the warranty information of your chosen model. Any good company should stand behind their work, and if they don't, it might be a good idea to avoid their products. Many nailers are made in such a way that a person can use them with either the right or left hand. If you are right-handed and your gun is only for personal use, this factor will not be particularly important for you. However, if you are buying for a work crew, this factor becomes much more important. If you force your workers to use a tool with the wrong hand, and they have an accident, you could potentially be held liable. Choosing a nailer that can be used with either hand will ensure that no one can accuse you of negligence and sue you accordingly! Safe operation of the nailer is of the utmost importance. While tool safety is largely determined by the user, it is a good idea to select a nailer that makes it easy to be careful. One common safety feature is a thermal overload shutdown sensor. This is made to protect the tool, and also the money you have invested in it. Like any motorized tool, a nailer can become too hot with repeated use. This is why it is advisable to avoid rapid-firing your nailer for extended periods. The better models will usually have a sensor that automatically shuts the tool down when it becomes too hot. It might seem frivolous, but you should look for a nailer that has a clear and visible LED power indicator light. This will tell you if the tool is on or off at any given time so that you can use the appropriate level of caution. As a side benefit, it will also tell you when the battery is running low on cordless models. 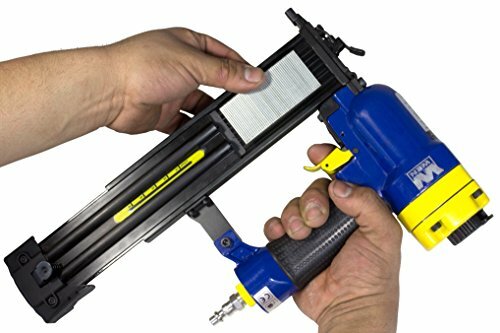 Many nailers like the best 23 GA pin nail guns will have a rapid-fire option that allows you to simply press the tip of the gun against the surface to engage the trigger. This can be very helpful for certain jobs. However, a brad nailer does not actually need this feature. This is because a brad nailer is meant to be a small, high-precision tool. Thus, it is not practical to use the tool in a rapid and haphazard way. I would consider this feature to be a low-priority one because of the skill required to use it properly. Most nailers can be adjusted to fit the job at hand. You can control the depth to which the nail is inserted and the amount of power used. When considering the purchase of a brad nailer, you should look for these adjustments because without them, certain jobs will be much more difficult if not impossible. Normally, a nail gun will leave a small hole that should be sealed with wood putty. Going too deep will make this task much harder and going too shallow will expose the nail and defeat the purpose of the tool. For a cordless model, battery life is very important. Manufacturers will tell you how many nails you can (supposedly) fire from one fully charged battery, but I have found that these numbers tend to be inflated slightly. When buying the best 18 Gauge Brad Nailer, you first need to decide on the nail sizes you are to work with. While most 18-gauge nailers are designed to use a nail length of 5/8 to 2 inches, there are brands that use smaller or bigger nails. The source of power should also be in your mind since there are electric and corded, electric and cordless, and pneumatic 18-gauge nailers. The first two types use electric power while the pneumatic is a 18 gauge air brad nailer which means it is operated using compressed air. The best nailer is one that comes with an adjustable nail depth, power settings, and jam clearing features. To fine-tune how deep the nails are driven into your material, some nailers may only need your bare hands while others require tools. Before deciding on the 18-gauge nailer you want to buy, you need to consider the type of project you are looking to work on. This will help you pick the nail size as well as depth of the nails based on the stability of the project. It´s not the same working on frames where are more convenient framing nailers than working on proyects where you just need the finishings. Ask yourself, how convenient the nailer is for storage, transport, and use. A lightweight, and compact is easier to handle, carry around etc. You need to find one that comes loaded with your desired features. The nose design will influence how deep and accurate your nailing is. Narrow nose designs allow the nailer user to drive nails to the precise spot even if it is in a tight space. Most 18-gauge nailers have a reload indicator or a display window that helps you see whether the magazine has nails or needs a reload. The capacity of the magazine matters because it determines the number of nails you will have at a time. Most 18-gauge brad nail guns have a magazine capacity of 100 nails. Additionally, consider how easy it is to open, lock, and close the nailer. You need to first load the brad nailer with the correct nail length. Load them in continuous strips and as you work, keep looking at the reload indicator to avoid dry firing. Shut and lock the magazine to begin nailing. The power source will determine how you put the nailer on/off. The 18-gauge brad nailers are the most versatile of the other types because they can be used to finish various projects. Remember the time you needed to make little home repairs and you didn't have the right tool. A brad nailer is will come in handy when making repairs on upholstery, furniture and other light pieces of wood. It can also be used for tacking carpets, mounting base moldings or building new stands. You may not need to call a professional carpenter for little tasks such as those if you have a brad nailer. A brad nailer is safer to use than using a hammer. You don’t have to hold nails in place with your fingers and thumb before hammering, this reduces the risk of personal injury. Brad nailers get the job done faster since all you have to do is press the trigger. Always wear safety goggles, hearing protection, and hand safety gloves during maintenance. If the area is dusty, you may also need to wear a dust mask. Disconnect air supply when clearing a jam, servicing the tool or moving the tool to another work area. Always assume the brad nailer is loaded at all times. Don’t point the tool at yourself or towards others as this might result in personal injury. Keep children and untrained persons outside work area to prevent injury. Don’t operate the tool when under the inﬂuence of drugs, alcohol or any other substance that will not allow you to be focused at all times. For your brad nailer to last longer, you need to do regular maintenance on it. Make sure you turn off your brad nailer before performing any maintenance task on it to prevent personal injury and damage of the tool. Never fire brads at yourself or another person. A single misfired brad can lead to severe injury. Inspect the tool before each use to check for loose or damaged parts. Do not use the tool if any part is damaged or missing. You also need to inspect the battery every few months and make the necessary replacements. Clean the external part of the brad nailer with a soft damp cloth to remove dirt, dust, oil, and grease. Avoid using solvents to clean plastic parts of your brad nailer. Most plastics are prone to damage from commercial solvents. Store your brad nailer in a clean, dry location and out of the reach of children and untrained persons. Because screws and bolts tend to loosen over time with use, you need to tighten them from at least once a month. You don’t want the parts flying about during operation. Clean the feed system daily by using compressed air to blow out any dirt stuck in it. When replacing parts of a nailer, use only factory-authorized replacements parts from the manufacturer to avoid product damage or hazard. If you have a cordless nailer, you need to inspect the battery periodically to check for the expiration date and make necessary replacements. If you plan to use your nailer in dark or low-light conditions, you should seek out a model with a built-in lighting system. This is simply a set of lights mounted on the front of the tool, which will light up when the nailer is powered on or in use. You should also think about angled shots. There will be times when you are unable to nail a flat surface, and you will need to go in at an angle. This practice is colloquially referred to as "toenailing". If you expect to use this technique frequently, it would be a good idea to contact the manufacturer and find out if your model was designed for it. In general for this situations is better a ​15 finish nailer. One final thing to consider is versatility in terms of the kind of brads you can use. Brads are made from 18-gauge wire and are thus of a standard thickness. However, they range length from 5/8 of an inch to 2 and 1/8 inches. If you want one that fires brads of two inches or greater, you will likely pay more. Don’t try to straighten bent brads, doing this will only make it bend further. The best thing to do is replace the brads completely. Nailing brads close to the rim of a wooden board might split and damage the board. Check your nail clip from time to time and replace brads when necessary. Most brad nailers will continue to fire even when the clip is empty. This can damage the brad nailer if it happens often. Don’t grip the trigger too hard when firing nails. A brad nailer recoils slightly when a nail is fired, holding the trigger too tight will allow the nailer’s nose to hit the wood which may result in damage to the tool. A: Most brad nailers use a flywheel technology in which a spinning flywheel provides the driving force needed to fire a nail. However, some cordless brad nailers known as Paslode nailers have a canister of fuel that provides the driving force for the nail. A: Loading an electric brad nailer is similar to the way you load your stapler. You need to first ensure that your brads can fit into your nailer. Most brad nailers take between 5/8" and 2" brads. Slide the brad strips carefully into the magazine with the nail heads pointing toward the tool’s handle. Then push the magazine cover over the brads until it is snapped into place. A: Yes, electric brad nailers can be used to nail thin wood trim. Use a finish nailer for larger and bulky wood pieces. A: Yes, the most preferred tool for nailing quarter round is an electric brad nailer. A brad nailer automatically recesses small nails and nails boards with great accuracy. A: Yes. Brad nails are thin and fine, this makes them suitable for holding thin boards in place without splitting it. A: The major difference between a pneumatic brad nailer and a cordless brad nailer is their mode of operation. Pneumatic nailers use compressed air to drive nails while cordless brad nailers use a spinning flying wheel. Pneumatic brad nailers are used most times by specialists because they offer more power than a cordless brad nailer. They also cost less than brad nailers but when you include the cost of air hoses and compressors, pneumatic brad nailers are costlier. A: Disconnect the air hose from the brad nailer before you start loading it and ensure that your brads are of the correct length. Loading oversized brads may result in jamming of the tool. Then place the brad strip into the magazine in the direction of the tool’s firing end (similar to the way you load your stapler). Slide Magazine cover shut until it latches into place. However, this must be done with care so the brad strip doesn’t fall out of place after sliding the cover. A: A 16-gauge brad has a thicker head than the 18-gauge brad. Higher gauge numbers indicate thinner cross-section. 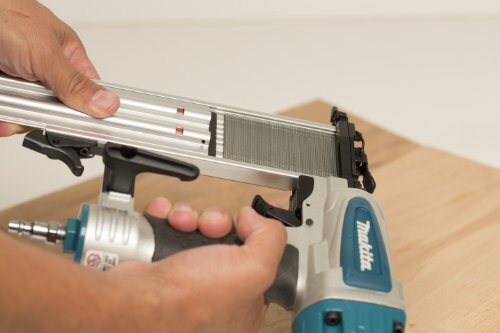 16-gauge nailers can fire nails that are up to 21/2" long while 18-gauge can only fire nails up to 2" long. A: Although some brad nailers can perform multiple functions and can be used for finish nails, brad nails and staple, I would advise you get a stapler for this. A: No, Finish nails are usually thicker and larger than brad nails, they might jam the brad nailer when fixed into it. A: No. Owing to the fact that brad nails are small, they can only be used to attach or frame any light wood. A brad nailer is only used for small projects and would not be appropriate for heavy duty tasks such as wood framing. A: For a brad nailer, you need to get a portable pancake air compressor with a high CFM rating (around 0.3 -0.5 CFM) and low amp motor. A: Make sure the air compressor is pressurized before you connect the brad nailer. 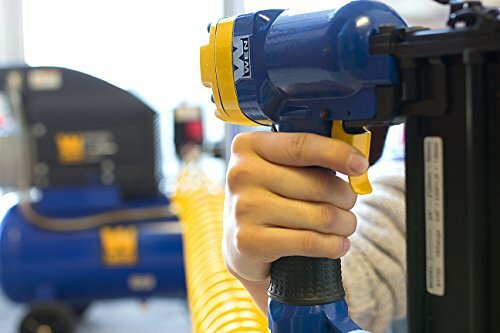 When the air compressor is ready, connect the air hose to the compressor and make sure that connection is tight enough. Tighten the connection with an adjustable wrench if it’s not tight enough. A: A crown stapler uses staples to fasten an object to another object while a brad nailer uses compressed air to fire nails into wood. A crown stapler is used most times to hold the fabric in place to a wood surface while a brad nailer is mostly used for cove moldings or baseboard shoe molding and other similar tasks. The best pneumatic nailer according to our research is the PORTER-CABLE BN200C 2-Inch 18GA Brad Nailer. Our top pick for the best cordless brad nailer is the PORTER-CABLE PCC790LA 20V MAX Lithium 18GA Cordless Brad Nailer Kit. We choose for the best electric brad nailer the Electric Staple/Brad Nail Gun, NEU MASTER NTC0040 Heavy-duty Tool.